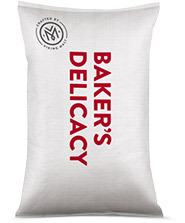 Delicacy Roasted Barley is produced by roasting good quality malting barley grains. The roasting process is similar to that of Black Malt with extra care taken to not burn the grain. Final temperature is more than 200˚C. The flavor of Roasted Barley is harsh and bitterer than that of black malt. Burnt and smoky flavors are strong. Roasted barley is used in dark bakery products, mainly for its strong coloring ability and roasted flavor. Roasted barley will import a dry flavor and substantial color.